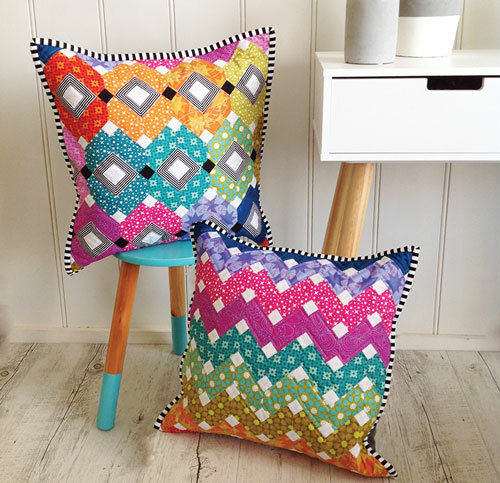 “Bejeweled Cushions” are the newest English Paper Pieced pattern from Lilabelle Lane Creations. Pattern includes full instructions for the two cushions on the cover and a third Bonus cushion pictured on the back. Each cushion utilises the same 4 custom shapes - a Polygon, a Half Elongated Hexagon, a small and large square. The pattern includes the precision cut papers for the sewists convenience. There are enough papers included to make any one of the three cushions at any one time, then the papers can be removed and reused for subsequent cushions. There are no perspex templates for this pattern and Sharon has created a free tutorial on her blog www.lilabellelanecreations.com to show you how to make your own templates incase you wish to fussy cut your fabrics. Also included in the pattern are Scan n Cut friendly pages as well as colouring pages for all three cushions. This pattern is F8 and Scrap friendly.